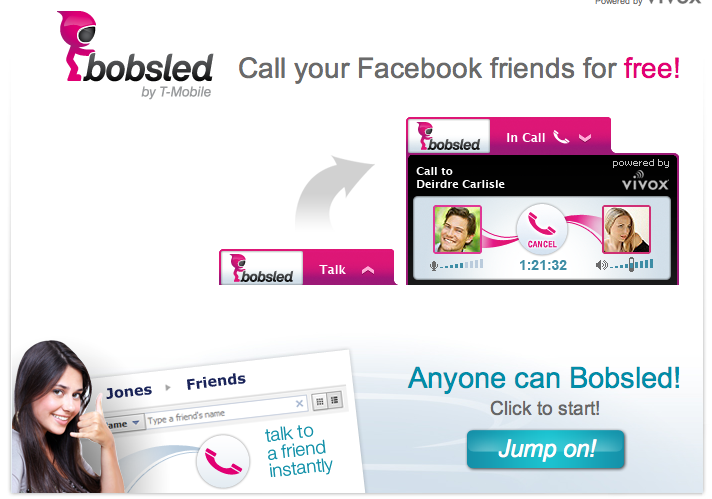 T-Mobile announced today that Bobsled by T-Mobile, their Facebook application for VoIP calling is back in action. Having pulled Bobsled off Facebook “shelves” due to a possible conflict with Bobsled being misinterpreted as an official Facebook application T-Mobile pulled it for some retooling. T-Mobile then announced yesterday that T-Mobile announced that Bobsled was ready for it’s re-unveiling. Well it turns out we didn’t have to wait long at all as T-Mobile sent out a short statement today announcing Bob is in fact, back in action. Bobsled by T-Mobile is now available, offering the more than 500 million Facebook users an easy and seamless way to call friends and family for free directly from Facebook. T-Mobile had temporarily suspended the Bobsled service in order to redesign the application’s user interface and more clearly differentiate it from a Facebook owned service. i’ve downloaded the extension for chrome.. but how do i use it? I’ve been waiting for the relaunch so i can try it out.. but have no clue as to how to use it.. anyone help? i did the exact same thing but it didnt work, then i downloaded it on ie and it downloaded like downloading a new software and now it works, but i havent tryed back on chrome yet. Only supports IE 8.0 and above, 32-bit. Boo! It’s lame now.. before facebook pulled the service, it integrated directly into facebook chat. Apparently facebook had a problem with that, so now it’s a completely separate chat window and it doesn’t display which of your contacts is currently online. Same problem here with FF 4 on Ubuntu 11.04. So far i like it. It has a couple of bugs, here and there. There’s definitely room for improvement. 1. Being able to send picture messages. 2. Multiple lines at once would be nice. 3. Display who’s online and who’s not. 4. Keep it on the same window. 5. And video would be nice. Thats’s all I got so far. Its easier to use a phone to call someone now. Bring back the old version!! Special use in this technique message and mms for my mobile not easily before. I used this app on facebook and i am disappointed. http://www.callarc.com has better facebook calling app and you can also get free credit to make free calls worldwide.